Focusing on the ways his art and persona were valued and criticized by writers, collectors, and artists subsequent to his death, this book examines the reception of the works of Albrecht Dürer. Andrea Bubenik's analysis highlights the intensive and international interest in Dürer's art and personality, and his developing role as a paragon in art historiography, in conjunction with the proliferation of portraits after his likeness. The author traces carefully how Dürer's paintings, prints, drawings and theoretical writings traveled widely, and were appropriated into new contexts and charged with different meanings. Drawing on inventories and correspondences and taking collecting practices into account, Bubenik establishes who owned what by Dürer in the 16th and 17th centuries, and characterizes the key locations where interest in Dürer peaked (especially the courts of Maximilian I in Munich, and Rudolf II in Prague). Bubenik treats the emergent artistic appropriations of Dürer-borrowings from or transformations of his originals-in conjunction with contemporary sources on art theory. The volume includes illustrations of numerous imitative works after Dürer. 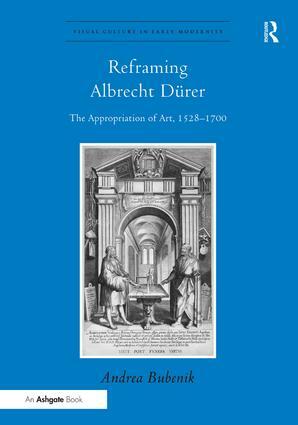 As well as being the first book to fully address the early reception of the most important of German Renaissance artists, Reframing Albrecht Dürer shows how appropriation is a crucial concept for understanding artistic practice during the early modern period. Contents: Introduction - reframing Dürer; Writing and depicting Dürer; Collecting Dürer; Appropriating Dürer; Conclusion; Bibliography; Index.